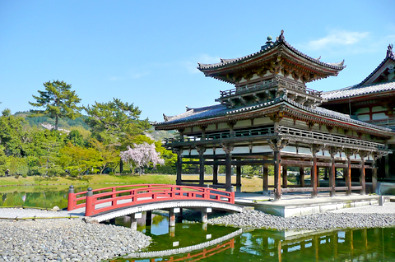 The star attraction in Uji is the celebrated Byōdō-in Temple. 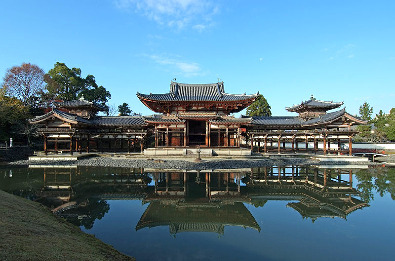 Known to everyone in Japan for its Phoenix Hall, featuring on the back of the ten yen coins, Byōdō-in is a rare surviving example of Heian-era (794-1185) architecture, and for this reason was added to the UNESCO World Heritage list in 1994. Originally built by Fujiwara Yorimichi in 1052 as a villa, the Byōdō-in was later converted into a Buddhist temple. One of the most remarkable things is about the Phoenix Hall (鳳凰堂 ; Hōō-dō"), also known as the Amida Hall, is that it is still the original 950 year-old building. The Hoshokan (or Byōdō-in Museum) contains remarkable "Bodhisattvas on Clouds" wooden statuettes from the Heian period, as well as the original temple bell and two phoenix from the roof. Admission is ￥600 for adults and includes the Hōshōkan. The Byōdōin is open from 8:30am to 5:30pm (9:00am to 4:30pm from December to February). Admission to the Phoenix Hall cost an additional ￥500. The Byōdōin is about 10 minutes walk from the station. Take the main street toward Kyōto until the river, then take the small touristy street on the right just before the bridge, pass the huge torii gate and go straight.